Each month, our Moon passes through eight phases. These phases (New Moon, Crescent, First Quarter, Gibbous, Full Moon, Disseminating, Last Quarter and Balsamic) are named after how much of the Moon we can see at that particular time. As the Moon circles the Earth, it looks as though the Moon's shape is changing, as the parts that are illuminated face us. 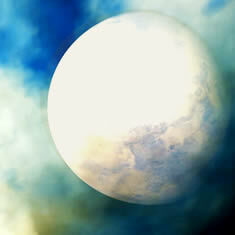 The complete cycle of Moon phases begins with the New Moon and ends with the New Moon that follows. Each lunar phase has an average duration of 29.5 days.